Descend back down the spiral staircase to the Parade. 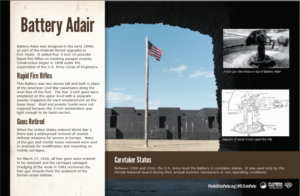 Continue to the right until reaching the next marker which describes Battery Adair. This emplacement for four 3-inch 15-pounder Model 1898 Rapid Fire Rifles was built from 1899 through 1906. The Battery provided the elevated mounts for the guns as well as protected magazines for each weapon on the lower level. The Battery was declared completely operational in 1906 and served until it was deactivated in 1920. Although Army records at the time show that the guns and their mounts were shipped to the Watervliet Arsenal in New York, they were actually simply thrown over the side of the Fort into the water below. When the moat was dug around the Fort in 1983, the four mounts and gun shields were recovered from the ocean bottom. Four slender, 14-foot-long metal objects buried in the mud were detected in a 1992 survey of the bottom of the moat in the same location that the mounts had been found. These are believed to be the gun tubes from Battery Adair. The four gun mounts have been preserved by the Bureau of Archeological Resources in Tallahassee and have been returned to the Fort. The photograph and the line drawing on the marker show what these guns looked like when they served at Battery Adair.